– I’ve settled on a methodology for incorporating positional evaluative error (in the draft) into the PVM prospect rankings. However, it’ll require me to reclassify close to 1000 player’s positions by hand (Pro-Football-Reference includes a lot of “DB” labels). Obviously that’s going to take a little while. However, I promise I haven’t forgotten about it. Lot’s of potential external distortions in this comparison, so we can’t draw much from it, but it is interesting nonetheless (and everyone loves charts). The correlation value is -.50, so pretty significant. 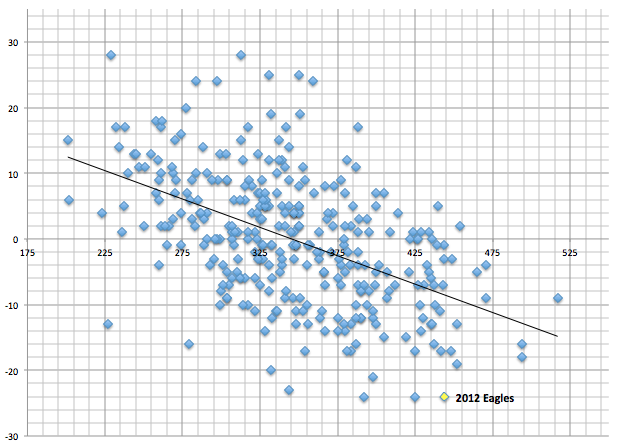 As you can see, the 2012 Eagles are way outside the normal range. Going back to the original question: Yes, it appears as though, given the TO differential, the Eagles should have been expected to yield MANY more points. It’s possible this is the result of where those turnovers happened (i.e. in the red zone). However, there are a lot of other factors potentially at work here. It may be that there’s an actual limit to how many points one team can allow (if for no other reason than a finite game time), so that the marginal increase in points allowed per additional turnover decreases to zero. I realize that’s a bit theoretical for a football blog, so you’re excused if your eyes glazed over reading it. Overall, my general take is that the location of turnovers is probably a real, but small, factor in the larger points allowed puzzle. – The 2012 Eagles forced and recovered just 5 fumbles. That is the eighth WORST in the last ten years (out of 320). – The NFL average within the sample is 11. – Fumbles are determined almost entirely by luck. – The Eagles threw 15 interceptions last year. The NFL average over the past 10 years? 15.76. – The 2011 Eagles threw 25 interceptions, so last year was improvement by 10. – From 1999-2011, the Detroit Lions made 17 1st round picks. Of those 17 players, just 3 have made a Pro Bowl, one of which was Roy Williams (WR). That’s 17.6%. – Of all 1st rounders picked over that timeframe (412 players), 34% made at least 1 Pro Bowl. – The Lions have been almost impossibly bad at drafting. – Quick trivia: name those 4 Pro Bowlers. Answer below in initials form (hopefully so a glance won’t ruin the question for you. – Answer: Their initials are LS CS SA DM. – Eric Winston, to my knowledge, is still a free agent. Hopefully he and his agent blink soon. Thanks for the endearing words. I am particularly impressed with your “diminishing returns” analysis; getting to the end zone takes time off the clock that the opponent would otherwise have to execute their offensive strategy. Given the relatively short duration of the football season (16 hours), the red zone drives that result in turnovers probably take up a significant portion of the entire season. Lito Sheppard, Corey Simon, Shawn Andrews and of course McNabb. You’re in-depth analysis is quite impressive. Not one to really give out advice. With a background in economics and statistics, I should be able to comprehend your thought process, but I’m struggling to follow some of your conclusion. You’ve done a great job crunching the data. If pointers are excepted, then labelling each axis and explaining where correlation and causation occur would be helpful. Again, keep up the good work…. only blog outside Tommy that gives new perspectives everyday. Understood. In the past I’ve been a lot more detailed in the explanations. However, I want to make sure it doesn’t get too dry. Careful balance to strike. Regardless, I should have labelled each axis in the charts. Thanks for the input.